Looking for best fly killer? In this post you will discover top 5 best products you can use to kill flies effectively. There is nothing for annoying than dealing with flies swarming around you in the house. Creating an environment that keeps the flies away is possible if you have the best fly killer. With the wide array of products that are available on the market, it can be confusing to determine what will work best. Follow this comprehensive guide and attain the knowledge needed to win this never-ending battle against the fly. The methods of killing flies seem to be as broad as the number of flies you have in the home! Some options are going to allow you to kill the fly on contact while others won’t work at all. Let’s take a look at the various methods on the market. There are several ways to trap the fly. The first is with the use of fly paper. This is also referred to as fly ribbon or fly tape. This device will attract the fly to an adhesive that causes them to stick to the trap. They are often hung near the ceiling where humans won’t get caught. There is normally a chemical of some sort that will attract the fly to the paper. Sometimes, this will also attract other pests such as mosquitos. Another trap is the bug vacuum. It is a small but powerful portable cleaner that has batteries. The unit will generate a suction that traps the fly inside. Sometimes the fly will stick inside and dehydrate until it dies. Other times they release the fly into the outdoors. This option seems popular with those who don’t want to kill insects. Dusting Powders are most often used in conjunction with another killing device. That’s because the powder in itself won’t be enough to kill the flies, but rather help control them in known entry points. Simply apply the powder in areas where flies enter the home. It is also wise to use near electrical appliances or outlets where sprays would be undesirable. Fly spray is an insecticide that generally comes in an aerosol can. It is sprayed directly on the flies to kill them, but also kills wasps and other flying insects. In extreme cases, foggers might be necessary to kill flies. This form of insecticide can require more preparation and materials than other options. Electronic fly light traps are great for indoor use and attract the flies to the device. They are popular in commercial buildings and restaurants. Electronic bug zappers kill the fly by electrocution. These are small appliances that are generally used outdoors. Many of these have safety precautions that keep people from being accidentally zapped. Electric flyswatters are hand-held devices that often look like a tennis racket. When the device comes in contact with the fly, it can zap him dead. Be aware that these do produce a shock and aren’t safe around children or pets. Along with the electric versions, there are also the old-school manual swatters. You can use these to hit the fly and kill him on contact. These are typically sold in mass retailers and dollar stores. Some people also enjoy the challenge of the fly gun. This spring-loaded projectile will shoot on to the fly and kill them. They are mainly sold in toy or novelty stores. Those who don’t want to use chemicals in their home often turn to natural remedies as ways to kill flies. Some of these methods include apple cider vinegar, essential oil and homemade flypaper strips. Not all home remedies are effective in ridding yourself of pests. What’s the best fly killer? Here are the top 5 best fly killer reviews for your consideration. My choice for the best fly killer is this eradication gun. It was re-launched in 2015 as a new and improved model. It now offers more power and great accuracy making it the best fly killer machine. This means less salt per shot. The texturized handgrip on this fly killer gun makes it easy to hold and allows for non-slip cocking. There is even a 90-day warranty from the manufacturer. I have to admit that this fly killer salt gun offers a fun way to kill the pesky flies. It sends out 80 shots of salt before reloading. In addition, the gun requires no batteries. The gun itself weighs just over two pounds and is easy to carry. The price is a little higher than what you would typically spend on a pest control product, but it sure does offer hours of fun! One woman claimed that her husband now purposefully leaves doors open in the summer so he can kill bugs. That isn’t a rare occurrence either; another woman said nothing makes her husband more satisfied than using his salt gun. When you are looking for the best fly killer for indoor and outdoor usage, this non-toxic product is a winner! The clear window trap is easily disposable and couldn’t be any simpler to use. It comes all ready to go; you have nothing to do as preparation work. The trap will apply directly to the window where flies like to hang out. The best part is that this fly killer for indoor also catches other bugs and insects. Pretty much anything that will get attracted to the trap gets caught. That means you can expect a full range of insect control with this product. They are lightweight and involve no chemical products. In addition, you can purchase a pack of 12 or packs of 24 depending on what your pest control needs are. A great place to put these when using them outdoors would be on windows where flies like to enter the home. When you break down the cost by trap, you see that it is reasonable and a great option for people on a budget. Each strip is about three-inches by eight-inches wide. One user was thrilled that these strips caught all the bugs. On the strips, they would find gnats, flies, mosquitos and other bugs they couldn’t name. Another user was overly satisfied with how discrete they were. They exclaimed that the strips cut down on the bugs they had without making it obvious they were catching flies. This powerful machine is the best electric fly killer. It doesn’t just attract and kill flies; it also targets moths, mosquitos and other flying bugs. The unit holds two UV light bulbs and a safety mesh screen. This screen offers protection for your family against accidental contact with the electrical grid. Aspectek provides a way to kill insects without the use of chemicals in the home. Instead, they meet their demise through the high-voltage metal grids. Surprisingly, this unit offers a simple installation. Simply hang the insect killer by the chain and hooks that come with the unit. You could also choose to set it on a solid surface. The removable plastic tray at the bottom of the unit will collect all the dead insects. This is easy to pull out and washable for quick maintenance. The electric grid is also self-cleaning. Many companies and food service establishment prefer to use this method for targeting flies. It is safe because it lacks chemicals and it is also simple to set up. The unit itself does cost a little more than many other bug repellants but seems worth the money since it is a non-toxic solution. It seems I am not the only one who has a high level of satisfaction with this machine. One user exclaimed that it was effective and easy to use. Another customer found a dead mouse inside her unit along with many other insects. Seems like it is a solution to multiple problems! When you have to find the best fly killer for yards, you want to look at this Burgess Fogger. It is the same system that gets used by professionals to kill flies and mosquitos. Not only does it kill the insects, but it is also effective at repelling flying insects for up to 6 hours after spraying. On average, it will treat 5,000 square feet in less than 10 minutes. It isn’t just the best fly killer for outdoors, but also quick and effective. In less than 5 minutes, everyone can safely enter the treated area; just wait for the fog to disperse. This fly killer for outdoor is powered by propane. Because of this, the fogger is completely portable. It is compatible with the 14.1-ounce tall style or 16.4-ounce short style propane cylinder. The price is slightly higher on this fogger, but because of the quick application the cost is worth it. Keep in mind that you’ll also have to purchase Black Flag, Cutter or Repel branded fogging insecticides to work with the unit. A user recommended using this fogger under the deck and front porch where other products don’t effectively treat. Another user was happy to proclaim that after two years, it was still going strong killing bugs at their home. When you need the best fly killer spray, you will want one from the reputable brand of REPEL. They offer the highest DEET concentration that is currently available in an aerosol spray. This spray can repel mosquitoes, biting flies, gnats, sand flies, fleas, chiggers and ticks. That means added protection from West Nile Virus. The 40% DEET formula is a high concentration and makes for the best fly killer for kitchen areas where bugs are swarming you; just be sure to keep it away from food preparation areas. While this effective and long-lasting protection is often used by people outdoors, there are multiple purposes for it. In fact, by using this fly killer spray, you are going to receive up to 8 hours of protection. This means you won’t have to reapply the repellent as you would with other brands. The spray is available in a 6.5-ounce can. It can be purchased in bulk if you need that much protection. It is a more expensive brand of spray but offers longer protection. Because of this, you will need less than other brands. Many users have tried this out in remote places filled with bugs and had success. One person took it deep into the Amazon while another was happy on their trip to the Caribbean and Central America. If it can work there, it can work for you too! Once you’ve decided on the best fly killer for home, it will be wise to know why you should use it. You will also need the instructions on the proper application if you plan to rid yourself of these pests. The pathogens live on their legs and mouths. It takes just a matter of seconds for them to transfer deadly pathogens from their bodies to your food. This is more the reason why you need a fly killer spray for indoors. While not generally seen as a fly, it is interesting to note that the mosquito is in the same family as a fly. Mosquitos are the animal which produces the most deaths on the planet. Only female mosquitos will feed on human blood. Mosquitos can live for 5-6 months at a time and females require a small amount of water to lay her eggs. They typically breed in dumpsters, garbage cans, manure and fermenting vegetables. A female house fly will lay up to 150 eggs at once. Her life typically lasts about 30 days in which she will lay eggs about 6 times. That’s up to 900 eggs in just 30 days! When the eggs hatch, they are maggots. These maggots survive best in warm temperatures and eventually seek out cooler, drier areas to live. Gnats are commonly thought of as baby flies but they are adults. Female gnats feed on blood. They are also known to carry parasites and diseases to livestock and humans. There are currently over 170 species of fruit flies. They require moist environments in order to reproduce. Females will lay 500 eggs in a single lifespan which is only about 22 days. These eggs are generally found in fruit or vegetables that remain unsealed. They also like to lay eggs in drains, mops, rags and leftover food particles. On average, a horse fly can be about an inch long. Their bite is often painful and can lead to inflammation and swelling. Despite the pain associated with a bite, it will usually heal on its own within a couple days. Here are some questions to ask yourself before making purchasing the best fly killer. What type of product is going to be ideal for my situation? This is the guiding force behind the product you ultimately decide on. Reference the top of the article if you have questions about the different options available to you. How much product will I need to complete the necessary application? You don’t want to start applying the fly killer to your areas and run out. Plan accordingly to how much you will need to purchase. What is my budget? As you can see, there are options for every budget available. Often, the more expensive options will be more powerful and tend to work faster, but if you can’t afford it, choose a lower cost option instead. What type of fly am I trying to kill? Some products work best on particular flies and you’ll want to be careful you choose only the best for your circumstances. There are also many fly killers that have the capacity to kill other bugs as well. This makes them a good value for the money. Not all fly killers are safe for pets and children to be around. Read the label carefully if you are unsure if the product is safe. Some products contain natural ingredients and you can use them if you aren’t interested in chemical pesticides. There are also the mechanical devices that will also kill without the use of chemicals. Always follow the directions given to you by the manufacturer. They offer the best advice when it comes to using their products. Here are some other tips you might find helpful when you are killing flies. When trapping flies, place the light traps 4-6 feet above the floor. Do not allow light traps to remain visible from outside. Never hang fly tape above food prep areas. Apple cider vinegar is a good attractant when preparing bait. Keep electronic swatters away from children. Remember to treat doorways and entrances to the home. Many fly baits are dangerous to children and pets. Keep out of reach for protection. Once you’ve cleaned up the fly infestation, you’ll want to take steps to prevent them from coming back. You may not be able to stop every creature from entering your home, but there are steps you can take to make it easier. Here are some helpful tips for you. Clean up all food promptly. Put all waste in a covered garbage can or down the garbage disposal. Clean the garbage can frequently. Get rid of used diapers immediately. Clean around and under appliances frequently. Wash all rags used for cleaning. Screen any open vents in the home. Fill any cracks or spaces in the home. Be especially aware of space around the pipes. As a review, my choice for the best fly killer is the Bug-A-Salt 2.0 Insect Eradication Gun. Not only is it effective at killing harmful pests, but it also provides for a good amount of fun. Purchasing a fly killer is only the start to living a life free of flies. It is going to require persistence, patience and hard work to keep your home a no-fly zone. Combine diligence to cleaning and the attention to detail to ensure that you and your family live a fly-free existence. 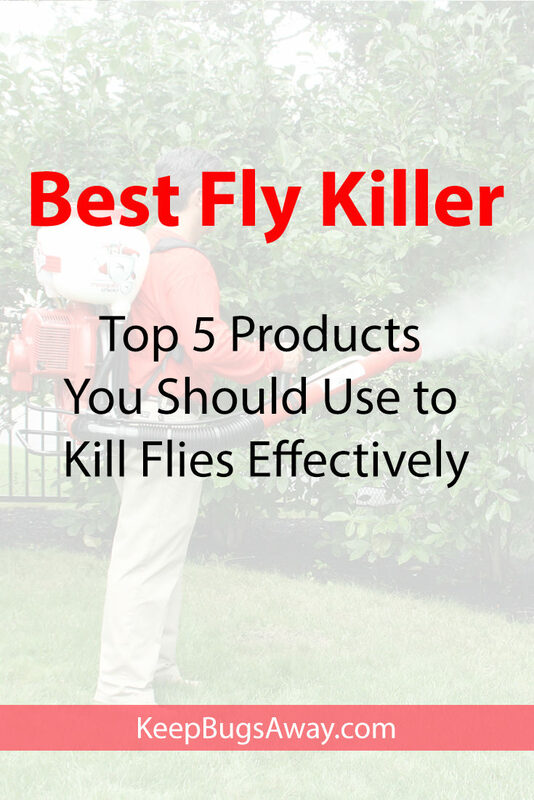 Enjoyed Top 5 Products You Should Use to Kill Flies Effectively? Share it with your friends so they too can find the best fly killer.